If asked prior to my research for this project, I would have most certainly stated that the Judgement set would easily be in my top 3. This is not only due to it’s amazing look but also its popularity then and even now. Most people with any knowledge of past tiers remember fondly the Judgement set. 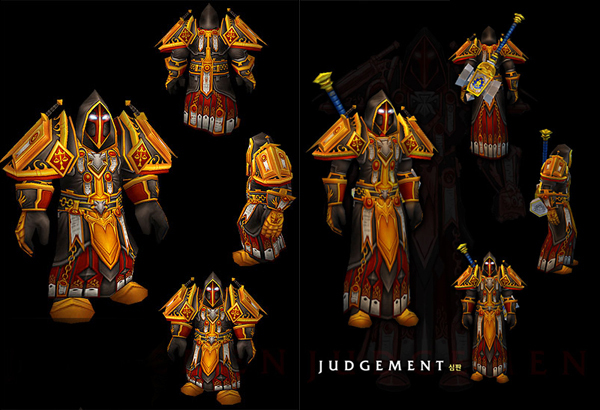 It’s placement at number 5 should take nothing away from its classic and epic look and as someone who currently plays a Paladin main, I would pay real money for the ability to use this set competitively in today’s tier 12 world. This entry was posted on August 18, 2011 at 2:41 am and is filed under General, HFL, MMO, Podcast, Raiding, Role Playing, World of Warcraft. You can follow any responses to this entry through the RSS 2.0 feed. You can leave a response, or trackback from your own site.